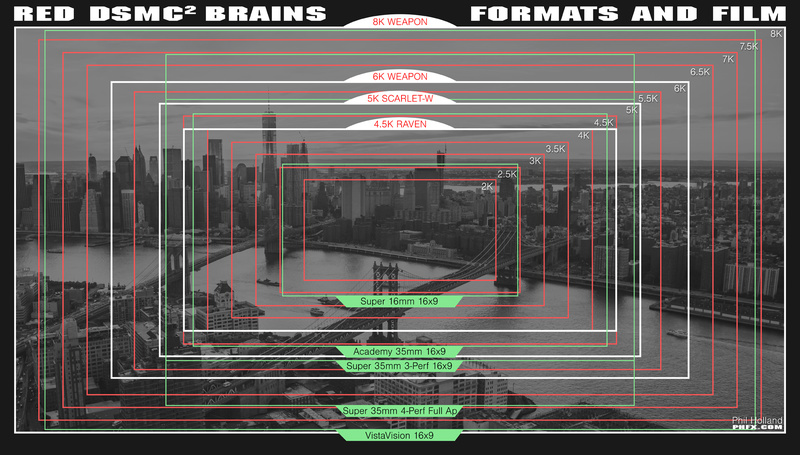 Weapon is an addition to the RED Dragon camera family as the new "highest end" camera brain. Upgrading Options and NAB 2015 F.A.Q. Scarlet and Epic Dragon bodies can be upgraded to Weapon. Upgrades are beginning this July. 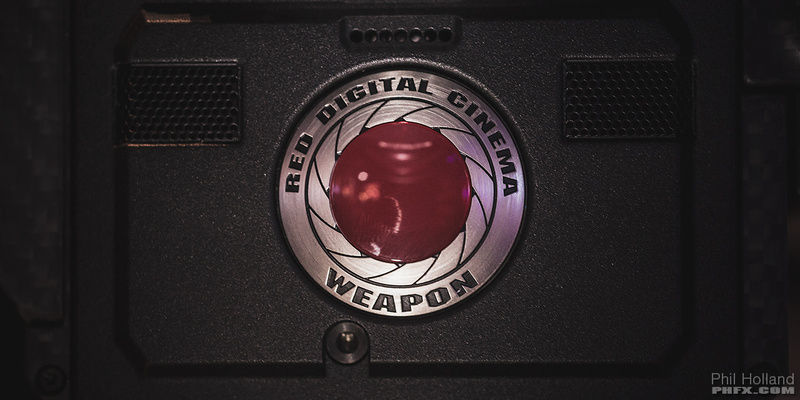 RED Weapon is the evolution of the DSMC camera body concept. The camera is smaller, lighter, and more powerful than before. Additionally this has opened up possibilities by making Weapon modules much more compact. - Simultaneous R3D and Apple Prores recording in-camera to the same media. - Faster Data throughput. Up to 50% higher data rates to card. Existing RED MINI-MAG 512GB cards are already ready for transfer speed increase. - Dual monitor ports on Brain for EVF/LCDs. - Automatic sensor calibration. Select exposure times from 1/8000s to 1/8s without calibrating. Wider operating band for sensor temperature. *You still Black Shade, however that single calibration in this case gives you a 10 stop shutter speed range. - Better thermal management. No Front Fans. Newly Design Top Fan and Rear Ventilation. This means a quieter camera with more stable operation temperatures. - Interchangeable and removable I/O options with accessible port placement. - Interchangeable OLPFs with smart detection of which OLPF is installed. - Monitor flip and mirror on all outputs, including SDI. There will be two main Weapon Dragon models and they represent slightly different features. Weapon Dragon 6K Carbon Fiber has more "under the hood horsepower" than the Magnesium version. - Weapon Dragon 6K CF supports 33x33x33 3D LUTs, while the MG model supports 17x17x17 3D LUTs. - Weapon Dragon 6K CF supports 2K ProRes simultaneous recording up to 120fps, while MG supports up to 60fps. Also, notable. The Carbon Fiber model has the horsepower to support the upcoming 8K Dragon Sensor Upgrade. Weapon Dragon 8K Carbon Fiber is a large format "Full Frame" or "VistaVision" digital cinema camera. It features a sensor that's 40.96x21.6mm and can record up to 60fps at 8K FF. At 8K WS it can shoot 75fps. 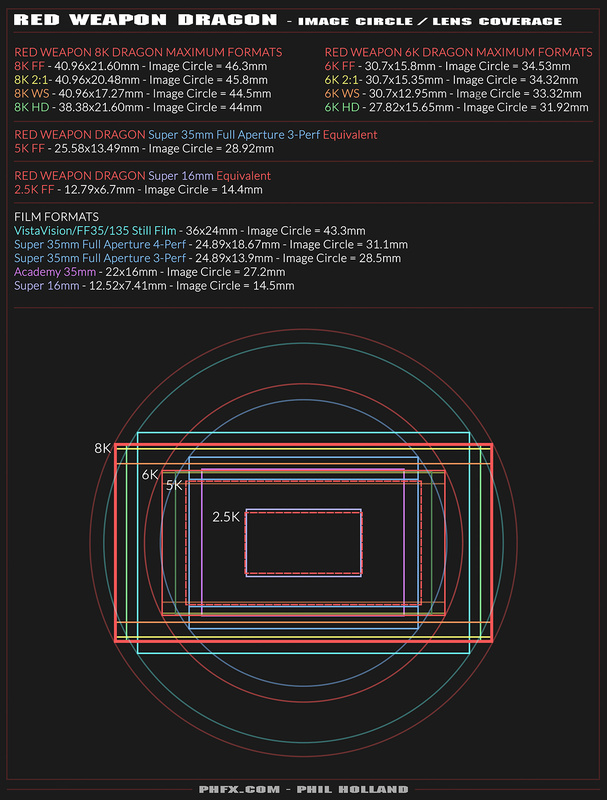 The 8K Dragon Sensor Upgrade is expected to ship near the end of 2015. - RED Weapon uses only MINI-MAG media. RED has announced two new MINI-MAG capacities and available SSD sizes are: 240GB, 512GB, and 1TB. - Weapon is compatible with existing power options such as RED BRICKS, REDVOLT, and REDVOLT XL batteries. You will however need new Modules to attach those batteries the Module Connection is different on Weapon than the Epic/Scarlet brains. The good news is Weapon does not need a Module Adapter in front of any of the new Modules as they connect directly to the Weapon Brain. - Weapon features two plated hard mounting points for new "cableless" display connections. This also means that there is also a new WEAPON RED TOUCH 7.0" LCD as well as a forth coming newly designed OLED BOMB EVF. - You can use the new Weapon LCD with LEMO Connectors/Cables by using the WEAPON LEMO ADAPTOR A to WEAPON LEMO ADAPTOR B. This is useful for those times when you need to be compact, but also flexible in situations where it may call for the display to be further away from the camera. - There is an additional plated connector on top of the Weapon brain. Currently one accessory that uses this connection is the new WEAPON TOP HANDLE which features a handy start/stop record button. - There will be more battery Modules on the way, but currently you will need the WEAPON REDVOLT XL MODULE to power the camera. More info soon on this. - The new Weapon SIDEKICK is Weapon's version of the SWITCHBLADE. SWITCHBLADE units are not compatible with Weapon. - DSMC SIDE HANDLE is not compatible with Weapon. However, a new Weapon Side Handle is under development by Element Technica. More info soon on that. -"I/O" can be achieved currently with three Weapon Modules. The WEAPON BASE EXPANDER, the WEAPON REDVOLT EXPANDER, and the WEAPON JETPACK EXPANDER which is designed for handheld and general gimbal shooting. - RED has also opened up Module Support and Development to select 3rd parties. OFFHOLLYWOOD's OMOD series of Modules are a good example of some of the possibilities being developed. - The RED Rocket-X works with Weapon footage. Q: What does that little screw at the base of the front of the camera do? A: That is the new placement for the Back Focus Adjustment, which is much easier to access than before. Q: Any improvements on what we can get out of the Dragon Sesnor? A; From Jarred: "Weapon Dragon is aprox. half a stop better in the low end than Epic Dragon. This is from the new processing." Q: Improvements on REDCODE Compression Ratios? A: Epic/Scarlet is 200MB/s , Weapon MG is 225MB/s, Weapon Carbon is 300MB/s. Still working on hard numbers to how this translates. Q: What about our LEMO A/C Adapters? A: Your LEMO A/C Adapter will work on various Expander and Battery Modules that feature a LEMO DC IN port. Q: Are current base plates and base plate accesoriess compatible with Weapon? A: Yes. Bolt on points on the bottom of the camera are the same. As is the rod standard heights to lens. Q: Can Weapon record "just" ProRes? A: Yes, that is supported at 2K at the moment scaled from the capture format you are in. Q: How much do the CF and MG Weapons weigh? 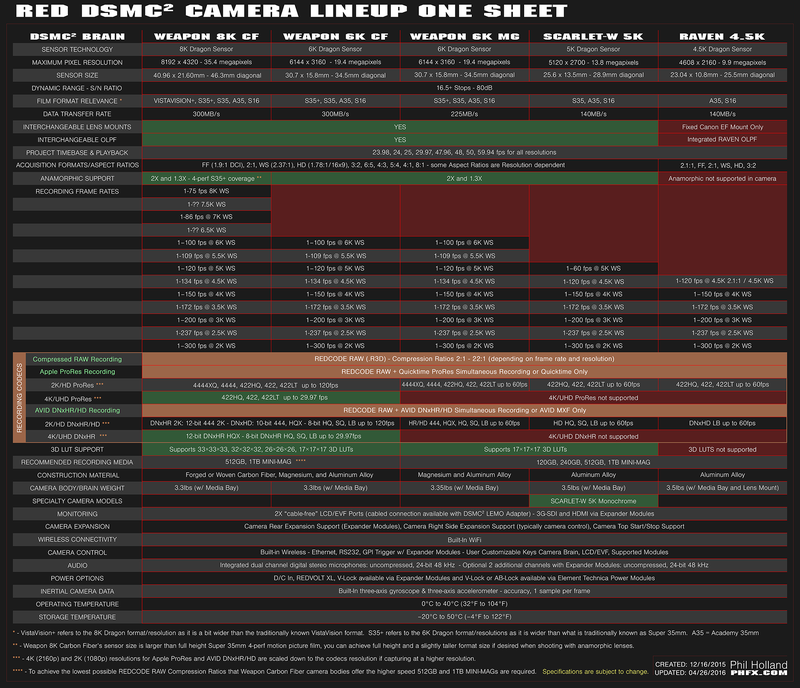 I whipped up a RED DSMC2 Camera Lineup One Sheet. This is a quick ways to see the difference between Weapon camera models and compare feature sets across the new DSMC2 cameras. I'll be updating this as relevant information arrives. Last edited by Phil Holland; 04-26-2016 at 06:40 PM. I personally think and hope that this Red Weapon is both a new camera body and a new sensor. Love it. Phil is on the case! Could use just a tad bit more info and data though. Request please. Why don't you and a few more of the LA based reduser boys take Jarred out for some drinks one of these nights. But has this been put anywhere that this is not a sensor upgrade and only a new body upgrade???? Oconners 2565D, Oconner 2065 , Movi M15 with MIMIC. More is coming. Keep in mind much of this just dropped in the last 48 hours. I didn't think we'd hear a peep until NAB, but we got a little February surprise hear. I'm going to try and visit RSH soon, but any info released is going to come through Red and Jarred. Any news if the current Mini-Mag SSD Module will fit on the Weapon? I know they will only take Mini-Mags. I wonder if the camera will be as modular as the EPIC, I imagine so. I hope they bring out 256GB Mini-Mags. Having 256GB Mini-Mags would really make that progression into the Weapon a heck of a lot smoother. You will send in your Dragon with your mini mag module and it gets upgraded along with the rest of the camera body.